The LOG is a bar and pizza restaurant in Williamstown, Massachusetts, so of course, they needed a tap handle that fit the name of their restaurant—it had to be a log. Not only is it the name of the restaurant, but logs also give off a woodsy vibe that makes students, professors and alumni feel at one with their surroundings while drinking beer. The LOG is located at Williams College, and it is one of the oldest buildings on campus. The owner of Ramuntos Pizza, Matt, is now serving both pizza and beer at The LOG, so it was his idea to create a custom log tap handle. In order to create the perfect design, Flip and his dog, Roxy, went on an expedition and found the most beautiful log to use at The LOG. In order to furnish off the log and prepare it to be used as a log tap handle, we brought it to Sarah at Free Fall Laser in North Adams, Massachusetts. 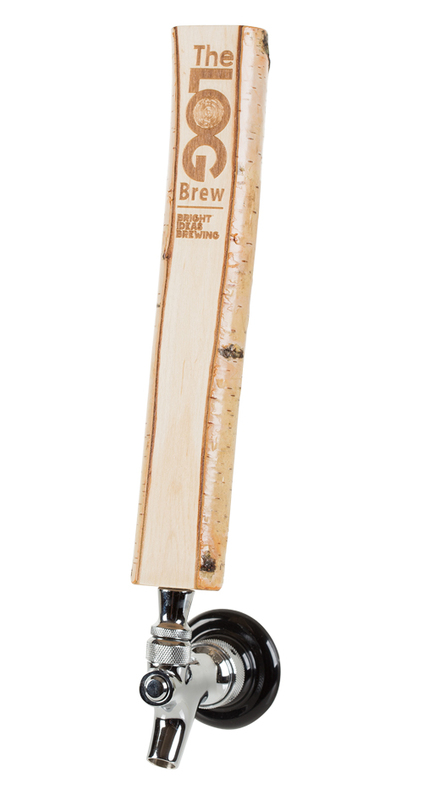 Sarah used a laser to laser engrave the logo of The LOG, as well as the logo of Bright Ideas Brewery, onto their new log tap handle. Once the log tap handle was finished, we attached it to the tap itself. The tan color of the wood complements the silver color of the metal nicely. Flip, Roxy, and most importantly, Matt, have all given their stamps of approval.